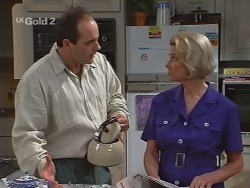 This site is an archive for episode summaries of the Australian soap opera Neighbours. Each summary archived here was written for Neighboursfans.com - Neighbours' largest and oldest online community. We have the biggest collection of Neighbours episode guides on the internet - starting from the very beginning in 1985 through to the present day. If you want to catch up an episode that you've missed, or if you want to reminisce about old episodes, this is the place that will keep you up to date with what's going on in Erinsborough! We have thousands of screencaps to go along with the summaries and all of them are labelled to help you to remember past characters more clearly. Please click on the links at the top to navigate the site and find the episode summaries for each year. Why not take a look back at your old favourites?